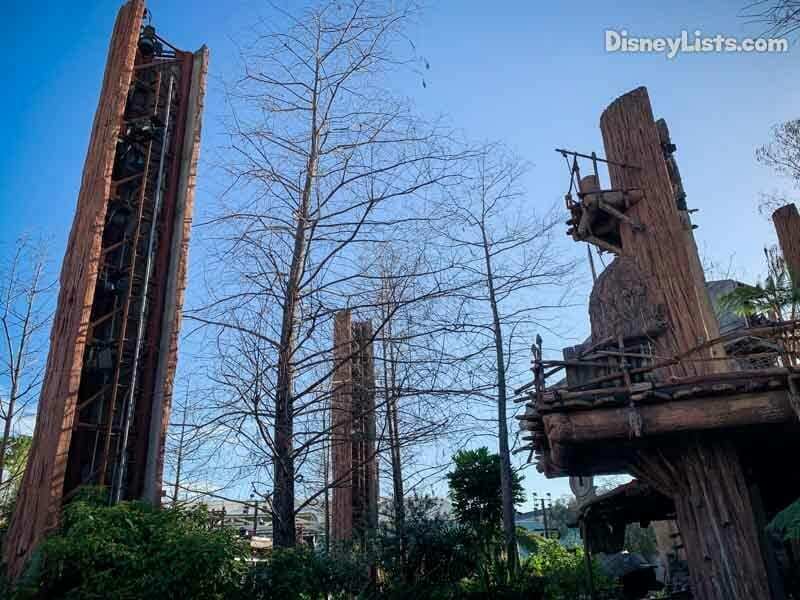 Even though we still have some time to wait for the opening of Star Wars: Galaxy’s Edge, there are already so many Star Wars attractions, characters, and entertainment that can be enjoyed at Disney’s Hollywood Studios. What you may not know about is Disney offers a Star Wars Guided tour is a way to take your Star Wars experiences to a whole new level. We recently enjoyed this tour. Catch all the details below. The Star Wars Guided Tour is a relatively new option that is offered six days a week (it is not offered on Sunday) at Disney’s Hollywood Studios. The tour features all of the Star Wars action that can be enjoyed at the park. The six-hour tour covers a lot of attractions, entertainment, characters, and more and has exclusive perks that make it compelling for guests. 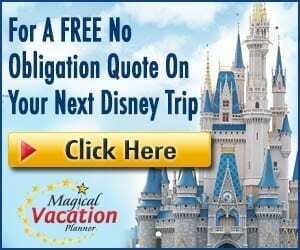 The cost of the tour is $99 with tax for both children and adults (DVC Annual Passholders and Disney Visa members currently receive a 15% discount). Admission to Disney’s Hollywood Studios is not included and must be purchased to take part in the tour. The tour begins at 8:00 am (which is usually an hour before park opening), which means you’ll get a jump on your day at the park. Upon check-in, you’ll receive a tour lanyard with your name on it and an audio device that you’ll wear during the tour so you can easily hear the tour guides. Two tour guides offer Star Wars history, tidbits, and secrets, that enrich the experience. The first stop on the tour is Star Tour-The Adventure Continues. You’ll hear the history of how Disney and George Lucas began their partnership with this attraction. We learned a lot about the attraction. Since the park was not open yet to day guests, we spent considerable time in the queue area where our tour guide pointed out many Easter Eggs and secrets. Next time you’re in the queue, be sure to look at the numbers on some pipes. One has the date of Harrison Ford’s birthday, and another has the birthday of James Earl Jones. We also learned why other numbers were chosen throughout the queue area—all had a significance of some kind. It was great to learn more about the attraction from the knowledgeable tour guides. Finally, we were able to ride the attraction with no wait. We learned why the tree logs were built this way on the Star Wars Guided Tour. Our next stop was to watch the short film, Star Wars: Path of the Jedi. This attraction is helpful for those who may not know much about the Star Wars film series. It retells the movie saga (through the Last Jedi) and hints at what to come. This attraction operates seasonally and was not open to day guests the day we took our tour. So, for that day it was the only way to be able to view it. Our next stop was at Star Wars Launch Bay. By now the park was open to day guests, and each of the Star Wars characters had wait times of about 15 minutes. Our tour group was split up into three groups, and we rotated visiting the characters. Since the tour gave us VIP access, we didn’t have to wait to meet the characters. We met Chewbacca, Kylo Ren, and BB8. These character greetings are always fun, and it was great to meet all three characters in the same amount of time you would meet only one. After the character greetings, we watched the short film in the Launch Bay Theater: Meet the Makers. This short film focuses on the filmmaker’s experiences. Recent updates include interviews and clips from Solo: A Star Wars Story. We expect the film to be updated later this year as we get closer to Episode IX. Next, we toured the props of Star Wars Launch Bay, while our tour guides gave us more history and secrets behind the props and items that are in there. While you can certainly tour this area on your own, I did learn a lot more about the items that gave me a greater appreciation for what goes into the Star Wars films. We were then taken to the spot where the March of the First Order begins. Included in the tour is the ability to march behind the Storm Troopers. After they passed us, we fell in behind them and walked up Hollywood Blvd. It was the closest thing we’ll get to be a part of a Disney parade! We then were taken to a special viewing area where we had a prime location to watch the stage portion of the show. Next, we were guided to Backlot Express. Because we had given our order when we checked in earlier in the day, our lunch was brought out to us just after we arrived, which saves a lot of time. We were delighted to find some gifts waiting for us. We received a commemorative placard, a Star Wars Name tag (which can no longer be purchased), and a Star Wars drink stein—Darth Vader. The drink steins offered rotate, but you’ll always get a Star Wars character stein. We were also treated to two Strom Troopers coming to check our identifications and interact with us. We were able to get photos with them. Finally, we were treated to Star Wars churros as dessert. Currently, the Star Wars Guided Tour is the only way to get these churros. They are not available for purchase anywhere at Walt Disney World and only available in the California parks. It’s another tour exclusive! After lunch, we went to Walt Disney Presents where we were able to see the model for Star Wars: Galaxy’s Edge and learn more about the upcoming project. We can’t wait for the land to open! Next, we arrived promptly for the stage show, Star Wars: Far, Far Away. Again, we had a prime viewing location which we didn’t have to wait for. This show lasts about fourteen minutes and is a must do for any Star Wars fan visiting Disney’s Hollywood Studios. We then went to the courtyard of the replica of the Chinese Theater at the center of Hollywood Studios. Star Wars premiered at the original theater back in 1977. Families that had children who were taking part in the Jedi Training Academy left for their appointed show. The children were guaranteed a spot for the training, and the parents had a reserved viewing location. The Jedi Academy has always been popular and having a guaranteed spot can be very important to families who want to make sure their Padawans get to experience the Academy. On the day we visited, the spots had been filled, and there was a waiting list. This is another tour perk for guests. Guests of the tour who don’t have children taking part in the Academy were free to go. I really liked how they scheduled the day to end with the Academy. Those not participating had the entire afternoon and early evening to enjoy the rest of the park. Finally, the day ended with reserved prime viewing of the nighttime fireworks show Star Wars: A Galactic Spectacular. I observed regular day guests lining up for good spots an hour before the show. This is not necessary with the tour. You’ll be instructed when and where to return, and you’ll have those guaranteed great spots, giving you even more time to enjoy the park. 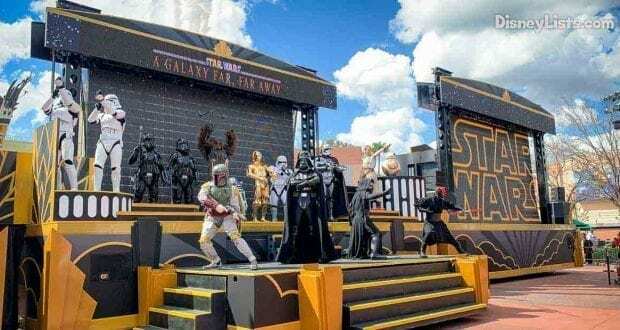 A reserved prime viewing area for March of the First Order, Star Wars: A Galaxy, Far, Far Away stage show, Jedi Academy Training, and Star Wars: A Galactic Spectacular nighttime show. Star Wars churro—at Walt Disney World it’s the only way to get it! I was very impressed with our tour guides. Not only were they knowledgeable, but they also did a fantastic job of keeping nearly 40 people together and on task. We arrived at our destinations on schedule. In particular, we arrived perfectly for the March of the First Order and the Star Wars: Far, Far Away show—we only waited about one to two minutes for these to start. They were also very helpful answer questions. Perhaps the most valuable aspect of the tour is the amount of time you’ll save and that saved time should be a factor if you are considering this tour. You’ll get to start your day 30 minutes before park opening (unless there is Extra Magic Hours). 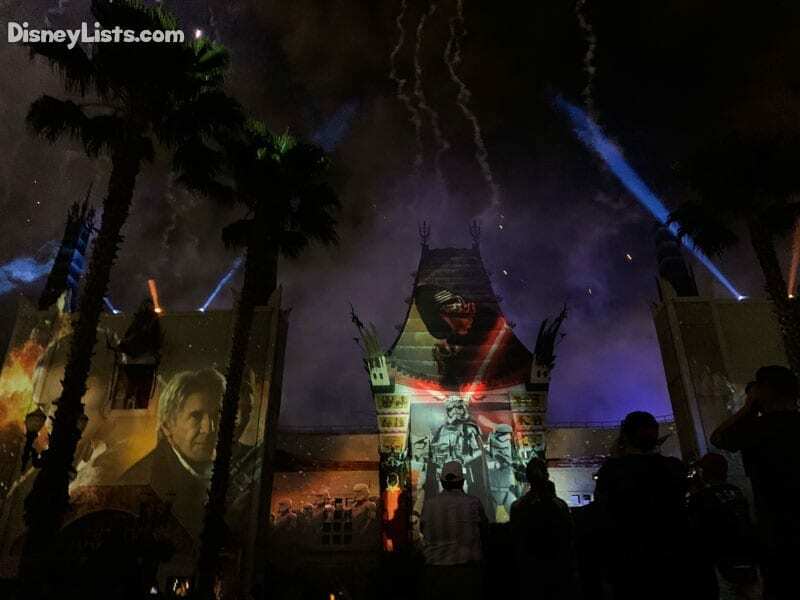 You’ll jump the lines for characters, and you’ll save a lot of time since you don’t have to arrive early for prime viewing at March of the First Order, Star Wars: A Galaxy, Far, Far Away stage show, and Star Wars: A Galactic Spectacular nighttime show. Lunch is also brought to you almost immediately upon your arrival, again saving more time since even with Mobile Ordering you’ll wait for food. After the morning portion of the tour, you’ll have plenty of time left in your day to enjoy the rest of Hollywood Studios. You can save your three FastPasses for the afternoon and enjoy everything else the park has to offer. And again, since you don’t have to arrive early for fireworks, you’ll have more time in the evening to enjoy the park. The Guided Tour is perfect for the ultimate Star Wars fan. You’ll get to experience every Star Wars attractions and entertainment with special access and benefits. You’ll get unique and exclusive benefits (listed in #11) available only to Guided Tour guests that you can’t attach a cost to. Whether this is “worth it” or not really depends on your goals while visiting Hollywood Studios and how big of a Star Wars fan you are. Yes, you can do almost everything on the tour on your own, but you should consider the exclusive benefits and the amount of time you’ll save on the tour. Like most of what Disney does, this tour is run well, has exclusive content, and is a real treat for any Star Wars fan. 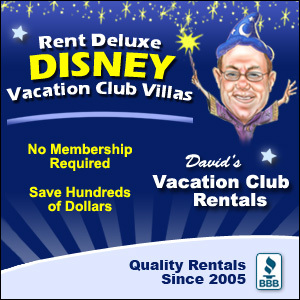 Call 407-WDW-Play to make your reservations. 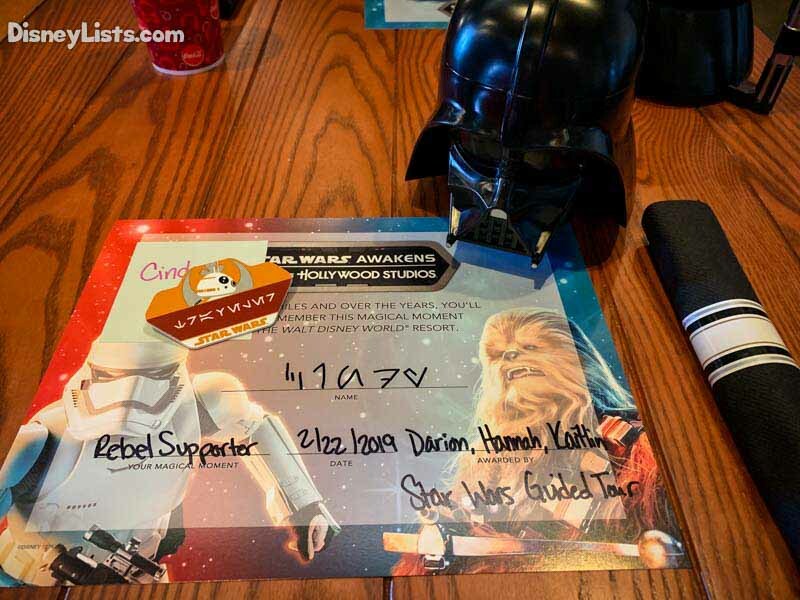 Editor’s Note: The Disney Company provided us with a complimentary pass to the Star Wars Guided Tour. However, as always, the thoughts and opinions contained in this article are entirely our own.